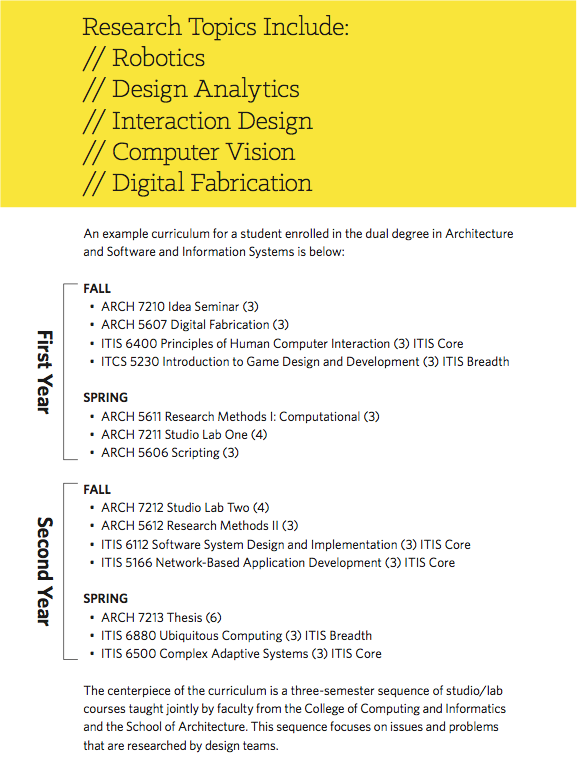 Students in this Design Computation Dual Degree Program will enroll simultaneously in the Master of Science in Architecture program and either the Computer Science degree (courses labeled ITCS) or the Information Technology degree (courses labeled ITIS). The core component of the curriculum is a series of StudioLabs which use a 'design as research' approach to a project co-taught by faculty from both design and computing. A certificate in a programming course offered online that is approved by the admission committee for the dual degree program (Intro Programming Computer Science with Python (MIT, EdX).